Rattling around the world’s biggest rail network, contending with icy temperatures and frozen equipment and racing to meet a strict deadline at the end of the line – that’s the challenge for the intrepid film-makers of Cinetrain. Since 2008 producers Tanya Petrik and Guillaume Protsenko have led regular expeditions deep into the heart of Russia, challenging a select band of directors and film crews to cast a new eye over the country. Each project is different, but typically involves about 20 film-makers travelling across Russia for a month, exploring thousands of kilometres of the country. The most recent edition in January last year covered 15,500km from Moscow to the Arctic port of Murmansk then across Siberia to Olkhon Island in the middle of Lake Baikal, a distance covering five time zones. The final deadline was the day the train pulled back into Moscow’s Yaroslavl Station: the first screenings were scheduled for that same evening. Seven directors, seven crews and seven short films presented a snapshot of modern Russia. The subsequent films have garnered great acclaim – the shorts filmed on that 2013 ‘Russian Winter’ tour have already won 10 prizes at international festivals, including a special mention at the prestigious Sundance Festival for ‘Love. Love. Love.’ But the project’s more striking legacy might be the way in which it has brought people together. Cristina Picchi, a London-based Italian director whose short ‘Zima’ (Winter), filmed last year, picked up five of those awards, recalled one memorable encounter: “About half way through our trip, we met some elderly people in an isolated, almost abandoned village – they were a couple, about 80 years old, and they had spent their whole life there. Even though we had an interpreter, they couldn't understand why we wouldn't speak Russian, and we later found out that they never saw a foreigner in their lives, we were aliens to them.” Despite a dose of mutual culture shock, the Cinetrain crews and the people they met as they traveled around the country found a way to get those stories onto the screen. Petrik, who is Russian, echoes the sense of different cultures colliding, but draws a contrast with officialdom. “We try to get a mixture of big cities and small towns, we try to get out into the depths of the country – it’s often more interesting there,” she said. The next Cinetrain trip, scheduled for September, explores the theme of ‘Contrasts’. One of the cities on the itinerary is Grozny, capital of the Chechen Republic, a region notorious for conflict and a hard-line local government – meaning those sometimes troublesome authorities could be a serious issue for the project. Cinetrain has always been ‘something different’. The 21st century Cinetrain is a descendant of a grand 1930s Soviet project, Kino-poezd, under the guidance of Alexander Medvedkin. Taking his cue from Lenin’s belief that cinema was the most valuable of the arts in the fledgling socialist state, he and his colleagues embraced the adventurous spirit of their time to put the studio on wheels and chronicle the transformation of the country, focusing their lens on people who had previously lacked a voice. The history also appeals to Maurice O’Brien, an Irish director and one of 21 film professionals to be chosen from 219 applicants for the September 2014 tour. “I knew about the story of the original Cinetrain, but would never have imagined taking part in a 21st century version,” he said. O’Brien has a long-standing interest in Russian culture and history, although he admits he’s no expert on the country – and the chance to explore is a big part of the attraction of the project. Previous participants tend to agree. Picchi, despite spending up to 12 hours a day filming outside in temperatures which plummeted to -35C and dealing with a whole host of frost-related technical issues, was thrilled with the whole project. “This experience changed my life, and I’m grateful to everyone – the producers, and my amazing collaborators, cinematographer Saulius Lukosevicious and sound director Henri D'Armancourt. All the difficulties we went through creating Zima gave me the measure of how much I love my job and how much I want to make films. 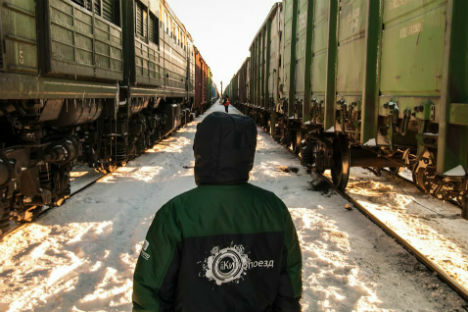 - Cinetrain’s ‘Russian Winter’ program is set to make its full-length festival debut on April 30 at the “Visions du Réel” international documentary film festival in Nyon, Switzerland. The festival screening is a compilation of the six shorts filmed in February 2013, including Picchi’s “Zima”. - The next Cinetrain trip, ‘War & Peace’, is scheduled for September. It will focus on contrasts throughout Russia, and plans to take film-makers from Moscow to Grozny, and also up to the Northern community of Salekhard on the Yamal peninsula, where traditional Arctic life meets the oil and gas industries.